Sam Frost once believed and taught the truth of Covenant Eschatology. Lamentably, he has now abandoned the truth and become an outspoken critic of this truth, claiming that he now knows the secret to refuting the idea that Christ’s end of the age parousia was in AD 70. Supposedly, no one is better equipped to refute the full preterist view than he is. He has recently begun filming a series of YouTube videos as a response to my YouTube videos in which I am presenting a thematic exposition of 1 Corinthians 15. As of this writing, Frost has produced four videos. I recently watched #3 and it is that video that I want to address. It should be noted that Frost is guilty of double speak. On the one hand, he says that Adam and Eve did die spiritually the very day they sinned. Thus, God kept His word / threat that death would ensue the very day they ate. Word kept. But, speaking of double speak. Frost claims that I speak “out of both sides of my mouth.” He stated that I actually say that God did threaten Adam and Eave with physical death, therefore, when they did not die physically that day, this means that God lied. This is a blatantly false misrepresentation of what I have consistently said! I have never said – as Frost falsely claims – that God did threaten Adam and Eve with physical death. Never! I have consistently said that “If” – “If” God threatened them with physical death if they sinned, then if they did not die that day, He had lied. It is sad that Frost has to stoop to misrepresentation to make his position look better, but, it is simply wrong. Frost acknowledges what is undeniably true: Adam and Eve did not die physically that very day. The lived 900 years later! So, why is it that Adam and Eve died spiritually the very day they sinned, in fulfillment of the threat, but, they did not die physically that very day, even though physical death was supposedly part of the “in the day you eat you will surely die” threat. How does Frost answer this conundrum, this patently self contradictory claim? Frost tells us, in video #2, that Adam and Eve, did in fact die spiritually the very day they sinned, but, because YHVH killed some animals and clothed Adam and Eve, that substitutionary sacrifice forestalled their physical death for 900 years! To say that this is a thorny, troublesome claim is a huge understatement! 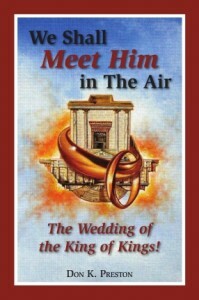 For a study of the implications of Christ’s substitutionary death, see my book, We Shall Meet Him In The Air, The Wedding of the King of kings. This book destroys the idea that physical death was the focus of the Curse in Genesis. This book has an in-depth discussion of the “Death of Adam” proving that the Curse was not physical death! Simply stated, this means that a person, in this case Sam Frost, runs to other texts and finds definitions of words, terms or phrases, and says that this definition must be the definition in other texts. Thus, the immediate context of any given text means nothing. What matters is what words mean in other texts and contexts. This is patently a misguided hermeneutic, yet, it is precisely what Frost is advocating. In anticipation of someone saying, “Preston, are you denying analogia scriptura, i.e. the use of one text to interpret another?” The answer is, “Absolutely not.” The issue here is that for us to properly utilize other texts we must realize and keep in mind that those other texts must be speaking of the same situation, they must contain the same essential context. It should be undeniably clear that in Frost’s appeal to other passages that speak of dying, that not one of them is a similar context. 1. In many of the other OT contexts in which death was threatened, and where the terminology of Genesis is used, it was often man threatening man with death. Not always, but in some instances. The point being that unlike in Genesis, man has no power to condemn other men with spiritual death. 2. The situation in Genesis is totally, absolutely unique. Man was in an unbroken fellowship with YHVH. In all subsequent texts, man was already in a state of alienation from God! Thus, there could not be a situation totally analogous to Genesis in the other texts. Frost’s application of these other texts is specious and illegitimate. It is an abuse of analogia scriptura. But, I do not want to dwell long here. I want to focus on Frost’s other arguments that he emphasized as seemingly devastating against the true preterist view. Frost seemed to think he had a major point when he claimed that when God threatened Adam and Eve with death, that in order for them to understand, appreciate and fear the threat of death, they had to have already seen death occurring! Without having seen death at work, Adam and Eve would not even understand what God meant when He threatened them with death. I must confess that as I watched and listened to Frost make this argument, I was stunned at the lack of critical thinking, the lack of logic, and in fact, the utter desperation that it must have taken to actually make this argument. I literally could not believe what I was hearing. According to Frost, Adam and Eve must have already witnessed death. But that means they had witnessed death while they were in the Garden, and before they sinned! Does Frost not know what he has said? Is he unaware of what his claim demands? This is stunning and self-defeating! Now, if Adam and Eve had already witnessed death, i.e. the physical death of animals, plants, etc., this means that the physical creation was experiencing death- in the Garden — prior to the Curse! To say this is troublesome for Frost is a huge understatement. Remember that prior to the Curse of Adam, God looked at what He had created– which, per Frost’s current claim, would have to include physical death– and He pronounced it “Good.” So, Frost’s position demands that death was present and visible to Adam and Eve prior to their sin, prior to the Curse entering. And, since it existed before their Sin and entrance of “the Curse” then physical death had been declared to be “Good” by YHVH Himself! How then, and why, would Adam and Eve think that death was bad, if it had been declared to be “Good” and they had witnessed it as a part of God’s “good creation”? So, why would they fear it?? There is something else here. Frost claims that one of these days, at the so-called “end of time” earth will be released from “The Curse that came from Adam and Eve’s sin. The curse that came through Adam was supposedly the curse of animals, bugs, slugs and mosquitoes! Frost’s eschatology suggests that earth will be restored to a pristine state where there is no death, no curse. However, do not forget that per Frost’s video claim, death had to have existed prior to Adam and Eve sinning. Thus, Creation was not placed under the Curse of Death as a result of Adam’s sin- death existed before the Curse– and it was part of the “Good” creation. But wait, yes, there is more! Let me re-iterate: Death was already part of the Creation that- per Frost’s new paradigm – existed (had to have existed) before sin entered, and, it was declared as “good.” So, in Frost’s futurist view, God will restore earth to its pre-sin condition, to its condition before the Curse entered, and yet, Frost’s position demands – logically- that death will exist in that restored Creation. But this will not work for Frost, because he believes that at the end of time, physical death is destroyed, because it is the Curse of Adam. This is stunningly self contradictory. You cannot affirm that death existed, had to have existed in the pre-sin, pre-curse world, in the “good” creation, and then turn around and say that God will one day restore earth to a state of “no death” where there is no curse of physical death. Per Frost’s own words, physical death had to have been a part of the good creation, before sin, before the curse world. It is patently obvious, just on these few points, that if one follows the logic in Frost’s video, physical death cannot be the last enemy, since death existed as part of the “Good” creation prior to Adam’s sin, and prior to the entrance of the Curse of Adam! Thus, Frost, based on his own claims, must now reject the idea that physical death is the last enemy. But wait, yes, there is even more. If Adam and Eve had to have witnessed death to understand what it was they were being threatened with, then they must have witnessed spiritual death beforehand, or else, per Frost, they could not know what God was threatening them with. And make no mistake, Frost does admit that Adam and Eve were being threatened with spiritual death. Do you see a train coming? If not, you are not paying attention! Let me express this in a hypothetical syllogism. It must be true that Adam and Eve had witnessed spiritual death before God threatened them with death for eating the forbidden fruit. If, as Frost claims, Adam and Eve had to have witnessed death prior to God’s threat, and if, as Frost admits, spiritual death was half of the threat that God made, then, undeniably, Adam and Eve had to have witnessed spiritual death prior to God’s threat! (BTW, how do you witness spiritual death? Don’t you have to witness a physical sign of the spiritual reality?) Exactly when and how did Adam and Eve witness spiritual death prior to their own sin and spiritual death? Frost clearly did not think his argument through very well. If Adam and Eve had to have witnessed death prior to God’s threat, and if God’s threat included spiritual death (as Frost admits) then that means that Adam and Eve had witnessed spiritual death – someone had sinned and lost fellowship with God prior them being threatened with spiritual death! Sin and spiritual alienation therefore, could not have entered with Adam and Eve!! It already existed! It had to have existed prior to Adam and Eve’s sin and they had witnessed it, or else, per Frost, they could not even understand what God was threatening them with! But wait, if spiritual death already existed before Adam’s sin, not only did sin and death exist before Adam, but, it means that spiritual death, existing before sin entered through Adam (Romans 5:12) had to have been part of the creation that God declared as “good!” After all, everything was “good” until the entrance of the Curse, right?? Death had to have existed prior to Adam’s sin. After all, Frost argued that Adam and Eve had to have already witnessed death prior to being threatened with death. So, if Adam had to have witnessed death to know what it was, then he had to have witnessed a Curse, before he sinned and received the Curse. But, if death existed prior to Adam’s sin, then sin existed prior to Adam’s sin, because, death brings sin, right? Creation was cursed before Adam sinned. To put it another way, if sin-death-curse go together as siamese sisters, then to say that Adam and Eve had witnessed death prior to being threatened with death, was to say that sin-death-curse existed prior to their sin, death, curse. This is inescapable. Finally, if Frost is correct to say that Adam and Eve had to have seen spiritual death before their sin in order to understand and fear what God was threatening them with, then without any doubt, Frost’s position demands that spiritual death existed prior to Adam and Eve’s sin, death, curse. Frost has thus created a brand new narrative in his desperate attempt to avoid the truth of Covenant Eschatology. He has created a doctrine unknown in the annals of church history. It is amazing and sad to witness what happens when men reject the truth and strive to sustain false doctrine. Frost has abandoned logic. He has abused hermeneutic, he has ignored proper exegesis. One can only hope that one day, he will stop kicking against the goads and come to his senses.